503-580-2936. 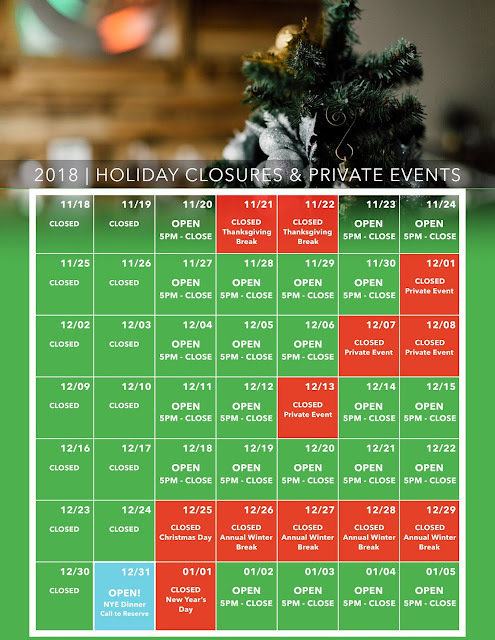 We have already been booked for several private events, so please reference the calendar below when making your plans to reserve. Normal business hours are Tuesday - Saturdays starting seating at 5:00pm with last reservations accepted at 9:00pm. We are closed every Sunday and Monday. However, we will be open Monday, December 31 for a special New Years Eve dinner. We hope you can join us for New Year's Eve Dinner!